Have you ever met a person who doesn’t like their picture taken? Chances are you have. They’ll tell you, “I don’t look good in photographs,” or “I don’t like the way I look in pictures.” People are very self-conscious and self-critical these days, especially in the era of selfies. Meanwhile, most people will tell you they don’t like the way they sound in recordings. “I don’t like the sound of my recorded voice,” is something you’ll hear time and time again, even from singers! 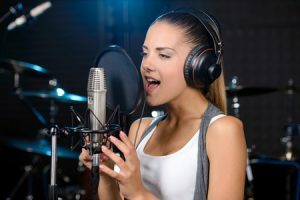 In general, if you sing and it gets recorded, your recorded voice will sound a bit different than your actual, “normal” voice. What happens to a voice when it’s recorded? With today’s modern technology, there’s such a thing as compressed files. That means the data is stored in such a way that the sound is modified, taking some of the robustness and “color” out of it. Some might say compression removes the emotion/life out of the voice, making for a colder sound. A lot of today’s pop music– the kind that hits the Top 10 on the Billboard charts– is compressed. Perhaps that’s why people are going back to vinyl records, to get a richer, fuller sound? Probably. Anyway, compressed files equal flatter, less rich sounds and tones. So, recorded voices may actually sound, to some people, “bad” or at least “worse” than what they hoped for. Plus, there’s the issue of hearing yourself– you might hear yourself differently than another person in the room hears you, and you might judge yourself more harshly because you **think** you sound “bad.” On some devices, the speakers may actually distort voices and make them sound “off.” As you can tell, there are a lot of factors that are in play when it comes to sound recording and how people hear and interpret sounds, including the human voice. For some people, they just don’t like the sound of their recorded voice because they know, deep down, they don’t have the singing voice they wish they had. That said, voices can be improved through guided training and practice. Sing Like A Star helps many people break through to a higher level of presenting their vocals to the world. Want to improve your style, tone, and/or overall sound, even for recordings? Why not invest in yourself with training from Sing Like A Star? Call 404-790-1830 or use this page for more info.